Town originally belonging to Moab; mentioned in Num. xxi. 25 et seq. ; Deut. i. 4, iii. 6, iv. 26, xxix. 7; Josh. ix. 10; xii. 2 et seq. ; xiii. 10, 21; Isa. xv. 4; xvi. 8, 9; Jer. xlviii. 2; Cant. vii. 5 (A. V. 4); Judith v. 15; by Josephus ("Ant." xii. 4, § 11; xiii. 15, § 4; xv. 8, § 5; "B. J." ii. 18, § 1; iii. 3, § 3), and in the "Onomastica Sacra" (117, 29 et seq., 253, 24 et seq.). Heshbon, at one time the chief city of Sihon, king of the Amorites, was, when captured by the Israelites, assigned to the tribe of Reuben (Num. xxxii. 3, 37; Josh. xiii. 10, 17, 21). However, the hold of the Israelites upon the territory of Moab was very insecure. It became a Jewish possession in the time of Alexander Jannæus (Josephus, "Ant." xiii. 15, § 4). Jerome mentions Heshbon, under the name "Esbus," as "a notable city of Arabia in the mountains in front of Jericho, twenty Roman miles from the Jordan." 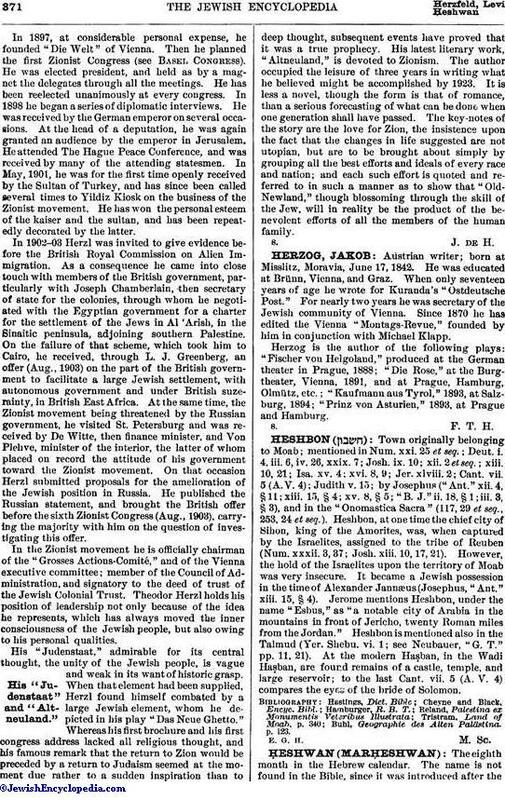 Heshbon is mentioned also in the Talmud (Yer. Shebu. vi. 1; see Neubauer, "G. T." pp. 11, 21). At the modern Haṣban, in the Wadi Haṣban, are found remains of a castle, temple, and large reservoir; to the last Cant. vii. 5 (A. V. 4) compares the eyes of the bride of Solomon. Buhl, Geographie des Alten Palästina, p. 123. E. G. H. M. Sc.